Covers by designer Christine Clayton. Dr. William M. Hutchins is currently a professor in the Department of Philosophy and Religion at Appalachian State University in Boone, North Carolina. His best-known work is surely his translation of Mahfouz’s Cairo Trilogy, although he also has translated works by Tawfiq al-Hakim, Muhammad Salmawy, al-Jahiz, Nawal El-Saadawi, Muhammad Khudayyir, Ibrahim al-Koni, Fadhil Al-Azzawi, Hassan Nasr, Amir Tagelsir, and others. ArabLit: You have translated four Mahfouz novels, correct? AL: The Trilogy & Cairo Modern? AL: Did your translation process change at all as you moved through these works? WH: Yes. The three volumes of the Trilogy were edited in New York at Doubleday by Jacqueline Kennedy Onassis, herself, using a pencil on paper. Nothing was emailed. I will never use the word “towards” again, for example. She said I used it too frequently. She thought that both Mahfouz and I found our voices after about the first fifty pages. Now almost everything is an email attachment, although I print texts out to edit them. 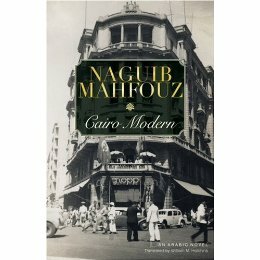 There is also a deliberate change in style by Mahfouz in the Trilogy from the stately, explain-everything style and the elegant but also back street vocabulary of Bayn al-Qasrayn to the much more modern, streamlined style and vocabulary of al-Sukkariya. I attempted to reflect those changes in my translation. AL: Did you learn anything translating the trilogy, for instance, that reflects in how you translated Cairo Modern? WH: Cairo Modern is almost a fourth volume of the Trilogy. I had first wanted to translate it years earlier, but that did not work out. Before I actually, finally did translate it I read the French translation by Philippe Vigreux. I am a big fan of his translations, but this one left me feeling that the hero is just a jerk. Why should I care what happens to him? So I tried to allow my sympathies for the hero to color my vocabulary, if that makes any sense. I wanted to call the novel Cairo Deco in honor of the period, Cairo’s excellent Art Deco architecture, and the “modernity” of the novel. Cairo Modern was a compromise. I did not want the novel to be read as a period piece about realities that were no longer relevant. I also wrote the blurb to defend the novel, by showing its cinematic parallels, against charges that it starts with several characters and only deals with one. What I learned from translating the Trilogy, in a nutshell, is that Mahfouz writes a tricky sentence. Until you try to translate him, you may not realize this. There are often little twists, little surprises; the sentence does not end up where you thought it was heading. The young university students, also, address each other with a mock solemnity, and I was challenged by an editor for bringing that to the English, but I remember that same slightly pompous way of communicating from my circle of friends at Yale University in the 1960s. AL: The Trilogy is a tremendously big and important work. Did you feel any reservations about taking it on? WH: I was asked to do whatever it took to produce a publishable translation of the Trilogy BEFORE the Nobel Prize. For years a complete translation had been sitting in a closet at the AUC Press, but someone there finally decided that it was not publishable, for whatever reason. At the time I did not realize quite how difficult Bayn al-Qasrayn is to translate but did know how important it is. So I agreed to help, rather naively, I admit. After only a few lines of trying to edit the extant translation, I decided that I would need to create a fresh translation. Once the Nobel event happened, Jacqueline Kennedy Onassis became involved and bought rights to the Trilogy for Doubleday. I assumed I would be fired but I wasn’t. I was given one year for each of the volumes but was still, as always, teaching. In a Wisdom of Solomon move the AUC Press put the names of the translators of the unpublished translation on the title page with mine, although their only input was my access to their extant but unpublished translation. AL: How do you feel, now, about your continuing association with it? WH: It is inevitably my most important work to date. When I met Mahfouz for the first time after completing the translation of all three volumes, I told him, truthfully, that it had not been merely a big job, but a piece of my heart. AL: Are there other books of Mahfouz’s you would’ve liked to have translated? WH: Yes, but after my translation of the Trilogy was successful, the then head of the AUC Press told me in person that I would never translate Mahfouz again. Full stop. It was a huge moment for me when years later the AUC Press asked me to translate al-Qahira al-Jadida, but the offer came in an email telling me that my attempts to translate al-Koni are worthless. AL: Back in 1989 you delivered a paper to MLA on “Translating and Editing the Cairo Trilogy of Naguib Mahfouz.” First: Was there a lot of editing involved? How so? WH: Mrs. Onassis edited not only the entire Trilogy but my paper about the editing of the Trilogy. She was an excellent, respectful editor and very thorough. It is very easy for a translator to repeat a word too frequently. She would point that out. There were some metaphors that she thought did not work (in Arabic or in English). I tried to resist any attempt to edit, back through my translation, the Arabic original. It was obviously not a new work that was open to “improvements.” If she questioned a word or phrase, I would always make some change but not necessarily the one she suggested. Inconsistent spellings of names were sniffed out and snuffed out–normal stuff. The only big controversies were titles/names. There was no way they were going to allow Bayn al-Qasrayn, etc. as street and volume names. The last controversy was for the final volume, which she wanted to echo the elegiac French translation title. Mahfouz backed me and said that al-Sukkariya is forward looking not elegiac. I thought that sugar might have a special significance for a diabetic, but also I wanted the connotations of a sugar-daddy. AL: What do you still find notable about translating the Cairo Trilogy 20+ years later? WH: That I did it in Boone, North Carolina, with some advice from an Arab friend who ran a motel here. I was allowed two questions, relayed back, to Mahfouz per volume. AL: Mahfouz’s short stories are lesser-known. Are there short works of his that you have particularly appreciated and think other readers would as well? WH: “Zaabalawi” is probably the best known; it deserves to be read. 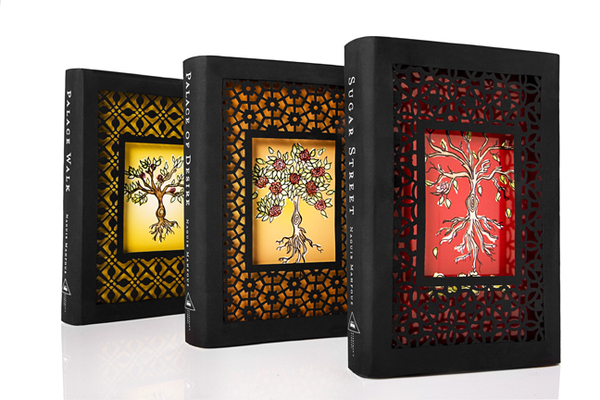 You can see more about Christine Clayton’s book covers (above) on her website. Now that’s what I call a good interview. You want to keep reading and the interviewee says something that gives you pause. Thank you Marcia! I don’t do anything…it’s all the interviewee. There’s another interesting connection between Jackie O and Egypt which I only learned of recently: at her funeral, a poem by Constantine Cavafy was read. Although Cavafy was ethnically Greek and wrote in Greek, he actually spent almost his entire life in Alexandria (there is currently a museum dedicated to him near the Cecil Hotel). I think…in her collection of poetry for children…there was a good deal of Cavafy. If I’m remembering it right. And according to Edward Said, she’d been wanting the Mahfouz rights even before the Nobel. Very enjoyable interview. I hope publishers will send Mr. Hutchins some more work! Alas, I’m probably going to wreck the mood by asking a crassly consumerist question, but where on earth does one find those beautiful hardcover editions of the trilogy featured in the photo? Oh, William has lots of work. Coming soon, thoughts from the designer!